Hello everyone, and welcome back to The Arcane Sanctum. As you see I have been trying to make some cosmetic changes, and after playing around with the options I still like this page layout the best. I hope these improvements make navigating the site a little easier as well. That being said I wanted to take a moment, and discuss another EDH deck with you all. This one has a special place in my heart as it was my first. In December of 2010 Wizards of the Coast announced a new product to support the player created format EDH. At that time I was only playing Standard, and had no thoughts of playing other formats (Modern was not even official until 2011), so for someone like myself this felt like a good starting point. As much as I enjoyed playing Azorius based control decks the thought of playing big powerful creatures, like one of my all-time favorites Angel of Despair, was really appealing. Outside of a Standard deck with these colors (that featured Ajani Vengeant, Blightning, and Tidehollow Sculler) I had little experience with the color combination that was eventually named Mardu. As I came to find out it was pretty strong. Just looking at Kaalia herself the basics of the card (2/2 flyer for 4 mana) may feel like a bad draft card, but that’s not why you play her. You do so to cheat in big creatures. Those creatures are also tapped, and attacking the same opponent that Kaalia is attacking. This also helps leave your mana open for other spells, and to play on either your turn or respond to an opponent’s play. Let’s take a look at the deck. Angels, Demons, and Dragons! OH MY!! As I mentioned above you want to cheat LARGE creatures into play. If the creature has an Enter The Battlefield ability, an ability that happens when combat damage occurs, or some other effect then that’s icing on the cake. Angel of Despair, a card I played a lot during the Solar Flare days of Ravnica through Time Spiral blocks, is able to destroy another permanent (yes, even land) when she enters the battlefield. Lord of the Void can be brutal in the early game against an opponent. One time when attacking a green player I was able to take their Oracle of Mul Daya, and the other 6 cards exiled would have led to that player being in a better position to just play the game. It wasn’t long after that the player scooped. For me Balefire Dragon is the definitive dragon. When it deals combat damage you can essentially sweep the opponent’s creatures with it’s effect, and to me it feels like the dragons of myth flying in to an opposing battlefield while breathing fire upon it’s enemies. You also have some really good support with these example cards. Liliana Vess can get any card from your deck, have your opponent discard a card (which may not be that helpful in a multiplayer format), and if you can ultimate her you get all of the dudes. Seriously. Reya Dawnbringer is one of my favorite creatures in the deck. As long as your creature is not exiled you can bring it back to the battlefield on your upkeep. Do not pass “Go”, do not collect $200. There are times you need to get rid of problem permanents. Maybe there are problems enchantments on the board. You may want to stop your opponent before they combo off with their artifacts. Merciless Evicition is probably the best “catch up” card that’s not in blue, and fits perfectly for this deck. Keep in mind it can also hit planeswalkers too. While those examples above are nice you are not without tricks, nor unfair things to do. If you’re facing a deck with a lot of removal then Avacyn, Angel of Hope is something you want on your side of the battlefield. Once she is in play you can attack every turn without fear of your permanents (not just creatures) dying. Once you have that established a well timed Armageddon can most assuredly lock the game up in your favor. Nothing of yours will be destroyed as long as Avacyn is in play when you cast this. However if there is just ONE opponent that you absolutely must defeat first you can’t go wrong with Master of Cruelties. With this card being a demon he can be cheated into play with Kaalia, and if your opponent has no blockers, or a way to remove him, then they lose the game once damage is resolved (because Kaalia and Master both have to attack the same target). He’s a one trick pony, and there aren’t many ways (outside of Phyrexian Reclamation) to bring him back to your hand once he dies. He would make a good blocker though once he does his work. This is a really good Midrange deck, and perhaps one of the most beloved decks since the line of Commander decks were created. Heavenly Inferno was part of the 4 decks reprinted in Commander Anthology so it’s still readily available as of the writing of this article. Why should you play the deck? You like midrange decks with giant creatures from the most iconic types in fantasy. You don’t like playing Blue, or Green for that matter. Destroying your opponent’s permanents, as well as them, is very appealing. Why you should not play the deck. You like to ramp to play big creatures. You want no one else to play the game during the match. 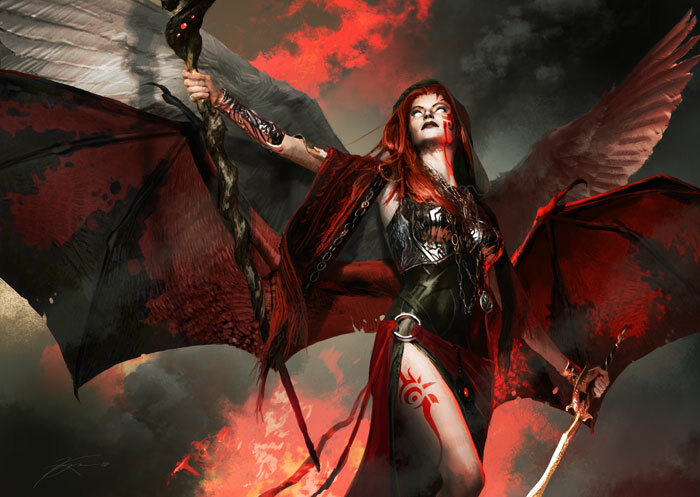 Kaalia is one of the first characters in Magic where I wanted to know more of her backstory. She also has one of my favorite fantasy classes: Cleric. So I had to learn more. If I was running a Dungeons & Dragons session I would definitely use her as a villain NPC, and perhaps give her the half-fiend template as well. Her story would definitely make for an interesting campaign. That’s what also helped me get, and maintain, interest in EDH. Magic was made as a game to play between Dungeons & Dragons sessions, and EDH seems like a perfect union between playing both Magic: the Gathering, and Dungeons & Dragons as you take on the role of your general while commanding the corresponding army in the deck. That’s all I have for today everyone. Thank you all for reading. Make sure you like, share with your friends, and follow me on social media (Twitter, and Facebook). Previous Everybody Was Jund-Foo Fighting. Those Plays Were As Fast Lightning (Bolt).